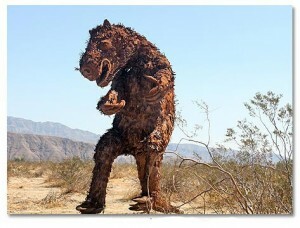 Imagine driving down Borrego Springs Rd. and something catches your attention. A dark form in the desert landscape. You look again and it is big, but it doesn’t seem to be moving. Then you look again and you realize it is a huge sculpture that has captured your attention. From the corners of your eyes these large structures can be deceptively realistic. The forms are prehistoric animals made out of steel by artist/welder Ricardo Breceda of Perris Jurassic Park. 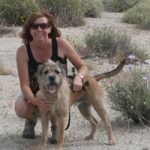 The animals are representative of the original inhabitants of Borrego Springs. The Gomphotherium free-standing art structures were the idea of Dennis Avery, land owner of Galleta Meadows Estates in Borrego Springs. 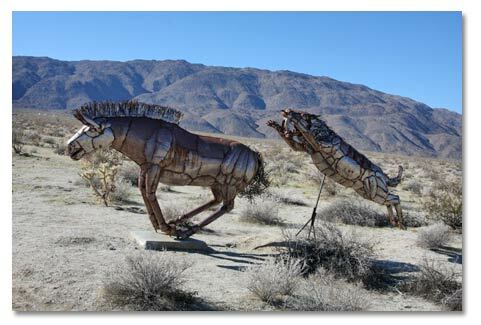 The art structures are placed in various locations along Borrego Springs Road and Henderson Canyon Road. The sculptures are set in natural areas where the animals appear to be a normal part of the landscape. It is a beautiful way to display this art and it makes for a more realistic experience when viewing the pieces. Avery owns the land and welcomes visitors to take a tour of the sculptures. 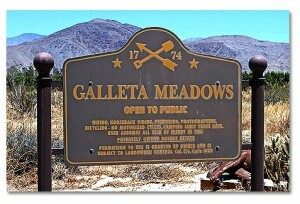 Galleta Meadows Estates is open to the public. 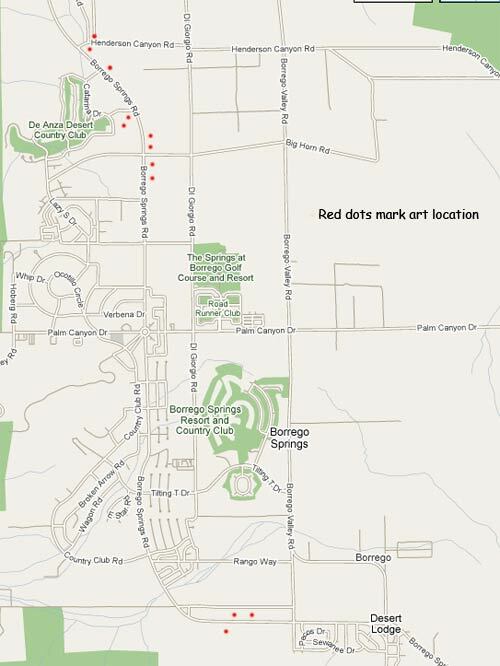 If you look at the red dots on the map below you can see all of the locations where you can view these sculptures. I would like to thank Dennis Avery for offering this beautiful art for viewing. It takes time and funds to build an art park like this and I think it adds something special to the Borrego Springs area! Follow DesertRoadTrippin . . . Previous articleBecome A Fan On Our Facebook Page!